It’s become a quite well known problem in recent years, that the space around Earth is full of junk; Old satellites, shrapnel from meteors, even rubbish from prior missions to space. A couple of years ago I attended a talk by Prof. Richard Crowther at the Salisbury Cafe Scientifique on the subject, and found it really interesting. Prof. Crowther brought along a piece of a solar panel which had previously been on the International Space Station (the ISS) to highlight the damage it takes during such a flight. It had lots of dents, some a couple of centimeters across, which he said could be caused by particles of rock in the scale of a few millimeters in diameter. Even a piece of rock only a few micrometers large was capable of causing a dent in the solar panel due to the velocities at which they were traveling. Unfortunately I do not have pictures of the panel I saw, but the European Space Agency has pictures of similar damage. It is particles such as these that are one of the major threats to space missions. Back on Earth, we like to keep track of the space environment. Around the world there are groups dedicated to the tracking of objects in space. Previously I have visited The Spaceguard Center in Wales, the location of one such group. This location deals mainly with non-permanent objects, however. Objects which are going to be doing fly-bys of Earth, or potentially even entering our atmosphere. However, the Center was in the process of getting new (and improved) equipment at the time of my visit. Perhaps they will in future move in to the monitoring of objects that loiter around the Earth, in orbit. The management of the space directly surrounding Earth is quite interesting to me. If you want to launch something in to space, you need to know where all of the orbiting objects are located, and at which times they will be in said locations. One of the main problems here is the size of objects. These can be grouped in to three main categories: Items which are tool small to be be tracked but are too small to be a major hazard (<1cm diameter), items which are too small to be tracked but big enough to be a hazard (1-10cm diameter), and objects big enough to be a major hazard but big enough to be tracked (>10cm diameter). The middle group is a major problem, as little can be done to mediate objects of this size. It is estimated that there are around 500,000 objects currently orbiting the Earth in this size range). Shielding on any craft being sent in to space is a must (to insulate, protect from radiation, and to protect from space junk). However, it can only be so thick before it becomes prohibitively large. Weight is a key variable in all space missions, and it needs to be managed very carefully. Some risk modelling can be done to try and minimise the amount of weight needing to be dedicated to shielding, however. A good example of this can be seen in the ISS. 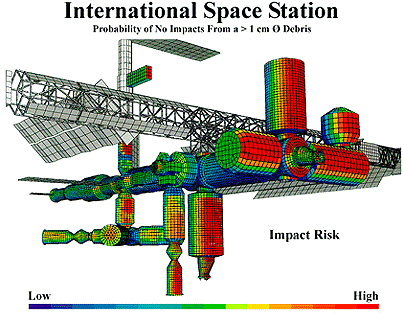 The above diagram shows the probabilities of impacts from objects over 1cm in size to the ISS, in its general orbit. Based on a model such as this, shielding can be concentrated in the areas which are most likely to take an impact. Some of the “inner” areas of the space station need less shielding as the outer areas catch the brunt of the impacts, much like how Jupiter protects Earth from impacts by being large and in the way. On occasion however, the ISS will change its current trajectory slightly to avoid risky objects, in an act known as a Debris Avoidance Maneuver (DAM). Generally these only occur once or twice a year. In the event that a threat is not detected until it is too late to make a DAM, the inhabitants of the ISS can shut down all hatches aboard, and take refuge in the Soyuz spacecraft for ease of evacuation, should this be required. This complete system means that the ISS has suffered no catastrophic failures due to debris so far. The design of the ISS can also help to increase the safety of space walks. The space-suits worn by astronauts during space walks have some shielding, but nothing like those seen on the ISS itself. Because of this, astronauts are under threat from any debris, including that which is under 1cm in diameter. To help to protect astronauts, the ISS can be maneuvered to “shield” astronauts during their operations. This is also done on any spacecraft when people are required to perform space walks. The deployment of objects to space requires a similar tactic. If bay doors are to be opened to release some payload, the spacecraft needs to be angled in such a way as to protect this unprotected area. So, where does all this space junk come from? As previously stated, a lot of it is “just there”. Once upon a time a massive piece of space junk smacking in to Earth, spawning more space junk, which then formed in to a massive, new piece of space junk which we now call the moon. A lot of the problems with space junk however stem from man-made creations. According to The Goddard Space Flight Center, there are currently 2,271 man-made satellites orbiting Earth. This excludes debris which may once have been satellites. This number is ever increasing. As space missions become more of a possibility for non-government organisations, this number is likely to increase even more rapidly. These satellites may not look like traditional ones, perhaps being quite small. Some such satellites are CubeSats. CubeSats are small cube-shaped satellites that are 10cm cubed, weighing less than 1.33Kg. These were incepted by University researches as a method of allowing academia to do research in space, without it being prohibitively expensive. The idea is that as these satellites are so small, large amounts of them can be sent in to space in one go, with the cost being split across the various satellite owners. In 2015, launch costs were put at around $100,000 per unit. As a result, CubeSats have become the first national satellites for some countries. It is arguable if initiatives such as this are a good thing. It is certainly good that more people are able to do research in space, as it means that we are gaining much more information on it. However, it means that the space surround Earth is becoming a lot more cluttered, making it harder for larger objects to be launched (and providing more objects for the ISS to dodge). Through careful calculations, objects are largely able to avoid each other. Satellites orbit at a variety of different heights around Earth, depending on their specific functionality and requirements. Low Earth Orbit (LEO) (between 160km-2,000km above Earth) contains the majority of satellites, as well as the ISS. A lot of satellites are placed here as due to the relatively low orbital height, less energy is required to enter orbit than for greater orbital heights. It is within this band that large amounts of space junk are present. The Joint Space Operations Center currently tracks around 8,500 objects larger than 10cm in diameter within this orbit. There are estimated to potentially be around one million objects larger than 2mm in diameter which cannot be actively tracked due to their size, according to a study by the Arecibo Observatory. The next furthest orbital band from Earth is the Medium Earth Orbit (MEO), which is from around 2,000km to 35,786km above Earth). Most satellites in this band are around the 20,200km mark, and are most commonly used for navigation (including GPS), communications, and space research. Currently, this band is not considered to be an area that is particularly suffering from issues with debris. There have been some prior incidents leading to increases in the amount of debris, such as the results of Project West Ford in 1963. In this project, it was proposed to launch almost 500 million 2cm long dipoles (known as Westford Needles) in to MEO to create a long-distance communications network. The operational lifespan of each needle was expected to be around 3 years. Although some needles were launched successfully, anomalous conditions were suspected to have caused a breakup in the packages being sent up leading to larger, longer-lived clumps of debris. 147 Westford Needle debris clumps have been cataloged, although around two thirds of these have re-entered and burnt up so far. It is also common for objects being launched beyond MEO to leave launcher debris behind in this orbit. One of the main reasons for the lack of protection for MEO is the size of it. The MEO band is 150 times the size of LEO and Geostationary Earth Orbit (GEO) combined. Satellites within the MEO generally face a much larger number of threats that those in LEO or GEO. MEO is also a less desirable place for satellites due to it lacking the ease of launch benefits of LEO, and the geostationary benefits of GEO. As such, only about 5% of operational satellites are placed here. Most of the concerns surrounding the MEO band are based on the systems existing there, especially the GPS and MIDAS satellite constellations. A report has been written by Nicholas J. Johnson discusses some of the reasons why MEO might need protection, although he does conclude that such protections similar to those desired for LEO and GEO may not be needed at this time. GEO can be found at 35,786km above Earth, placing it at the end of MEO. GEO is unique in that satellites orbit at a velocity allowing them to match the Earth’s rotational velocity, meaning the satellite appears to remain stationary in the sky from Earth’s point of view. GEO satellites need to be positioned above the equator, and at a specific height. Because of this, only a finite number of satellites may be in GEO at any time. There is also a requirement that satellites using differing radio frequencies so as to avoid interference. There tends to be competition among nations that share the same longitude (with differing latitudes), due to the equatorial and radio frequency requirements. Because of this, the International Telecommunications Union has created an allocation mechanism. GEO contains satellites with uses such as meteorological surveying, and broadcast/communications satellites. It is hard to assess the levels of debris in GEO due to the increased distance, but there is estimated to be less debris than in LEO. It may be that due to the limited amount of space in GEO, people take more care in not creating more space junk here. It may also be that thrust is required to maintain GEO, and so unpowered debris should in theory reduce to MEO. These guidelines have been picked up by organisations such as NASA, but there is no international law enforcing their use. Because of this, the problem of space junk is likely to continue to get worse. In 2009 the first accidental satellite collision occurred, in LEO. This collision took place between the Russian Kosmos-2251 and the US Iridium 33, destroying both satellites in the process. The Russian satellite had been out of commission (and so was no-longer actively controlled) since 1995, but the US satellite was actively manned. This collision created a massive amount of debris, in a large variety of sizes. By 2011, over 2,000 pieces had been cataloged by the US Space Surveillance Network. The risk to planned satellite launches in 2009 after the collision was calculated to be small, and no incidents occurred. The ISS however had to perform a DAM, and Chinese scientists claimed that some Chinese satellites in Heliosynchronous Orbit have been put at risk. As the debris was not placed in a controlled orbit, a lot of it was expected to decay in orbit until it burnt up upon re-entry in to the Earth’s atmosphere. As of 2014, 24% of the cataloged debris had done so. This collision (and various other near-misses) has highlighted the need for the safe disposal of defunct satellites, either by re-entering them for a controlled burn-up, or by moving them to a graveyard orbit, positioned far away from active orbital paths. The requirement for safe disposal became law in France in 2010, and in the US all geostationary satellites launched after 2002 are committed to being moved to graveyard orbit at the end of their lifespans. There are issue with creating legislation to combat the problem of space junk, as it would have to be pan-country. In 1972, The Convention on International Liability for Damage Caused by Space Objects was concluded and opened for signature. As of 2013, 89 states have ratified the convention, and 22 others have signed but not ratified. It is generally hard to create and enforce laws designed to be enacted across various countries, as can be seen in the issues recently with trying to police the internet. Indeed, only a single claim has been made under this convention when the nuclear-powered Soviet Satellite Cosmos 954 crashed in Canada, scattering radioactive materials and leading to an expansive clean-up operation. When Skylab came down over Australia the convention was not invoked, although Australia did fine the US $400 for littering. To encompass all laws describing the use of outer-space, the term “Space Law” has been coined. There is a fundamental issue with this field; International lawyers are unable to agree on a definition of the term “outer space”. In general, it does seem to be accepted to be from the lowest point at which objects can orbit (100km in height, known as the Kármán line). In it’s current state, there is no absolute Space Law to prevent people from “littering” in space. In 2007, China conducted an anti-satellite weapons test on one of their own defunct satellites. The FY-1C polar orbit satellite was destroyed by a kinetic kill vehicle, creating a massive amount of debris. It is in itself interesting that China would conduct such a test as it had previously voiced support in a proposed ban on space weapons, but that is not the subject of this post. This test resulted in the largest debris creating incident to date, generating 2,317 pieces of trackable debris and an estimated 150,000 pieces of untrackable debris. Again, a lot of this debris is expected to burn-up, with 70% of the debris expected to have done so by 2035. Seemingly in response to this the US performed their own successful satellite-killer test in 2008, generating even more debris. With all of this debris floating around, it seems that there is a potential for a Kessler syndrome event to occur. This event, proposed by Donald J. Kessler, is a scenario in which objects in orbit above Earth collide, and cause a cascade of collisions. Two objects collide, and generate debris. This debris collides with other objects, causing more debris, causing more collisions, etc. The more debris, the greater the chance of there being more collisions and so more debris. If such an event was to occur, it is proposed that entire orbital ranges could become un-useable due to the density of debris, and would likely have an impact on the potential for any devices too be launched from Earth. In theory, the more objects in orbit around Earth, the greater the chance of this event happening. So, there is a real need to address the problem. This could be done (as previously described) via controlled re-entry of satellites/ascension to a graveyard orbit, but there are potentially other methods of clean-up available to us. These methods could be especially useful as they have the potential to allow us to retroactively clean up the existing debris, rather than just help to prevent the creation of new debris. In my next post, I’ll be talking a bit about the clean-up methods available to us. Previous Post Snowing in Lancaster! Next Post The problem with space junk: What can we do about it?